Little Common player-manager Russell Eldridge. Little Common Football Club will be eager to produce another positive response to a rare setback and remain on track at the top of the table. The Macron Store Southern Combination League Division One leaders suffered only their third league defeat of the season - and first at home - when beaten 3-2 by Ringmer last weekend. 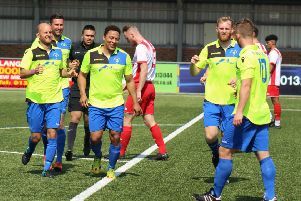 Common hit back strongly after their previous two league losses, winning six in a row after November’s 6-0 drubbing at Lingfield, and will be eager to continue that trend when they host Southwick tomorrow (Saturday). Kick-off is 3pm. Player-manager Russell Eldridge said: “It’s obviously a disappointing result and a bit of a setback in terms of where we were, but it’s one defeat - it’s not the end of the world. It only becomes a problem if it happens again. “I would like to think we will be mentally strong enough to bounce back and go on another run like we have done previously. Common’s advantage at the top of the table has now been cut to two points and second-placed Langney Wanderers have overtaken them in the goals scored stakes, although Common still boast the most wins of anyone in the division, best goal difference and fewest goals conceded. Next up for Common is a visit from a bottom-of-the-table Southwick side which held them to their only draw of the campaign so far. Common surrendered a 2-0 lead to draw 2-2 in the reverse fixture on the opening day. “The next game is the important thing, and to try and get three points on the board,” Eldridge went on. “I don’t really take too much notice of the last game (against Southwick) because probably a lot has changed since then. Common were missing five players through illness or unavailability against Ringmer, but Eldridge hopes to welcome them back tomorrow. In other news, Common scooped the December team of the month award for the division after winning all four of their matches in the final month of 2017, scoring 15 goals and conceding only two. A 4-1 win away to AFC Varndeanians on December 2 was followed by a 3-1 success at home to Mile Oak, 6-0 romp away to St Francis Rangers and a 2-0 victory in the Boxing Day derby at home to neighbours Bexhill United. Hole scored five goals in those four matches.